Boost your keto salads with Primal Kitchen dairy-free, low-carb salad dressings. Use Primal Kitchen coupon code FAT for 15% off all Primal Kitchen goods. 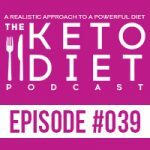 Leanne Vogel: You’re listening to episode number 39 of The Keto Diet Podcast. 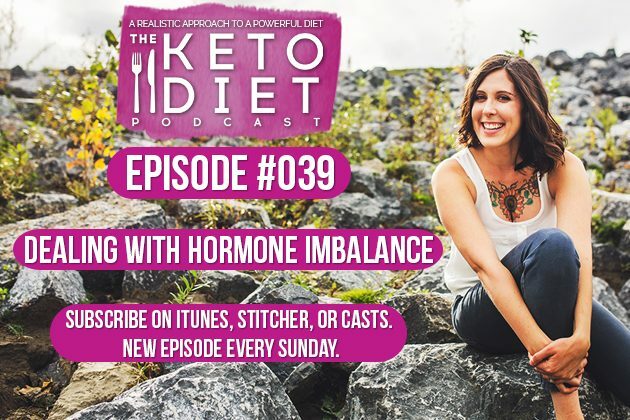 Today we’re chatting about the path to hormone regulation, the best fat fueled profile for hormone imbalances, and signs that your hormones are off balance, so stay tuned. Hey, I’m Leanne from healthfulpursuit.com and this is The Keto Diet Podcast where we’re busting through the restrictive mentality of a traditional ketogenic diet to uncover the life you crave. What’s keto? Keto is a low-carb, high-fat diet where we’re switching from a sugar-burning state to becoming fat-burning machines. All listeners of the podcast receive a free seven-day keto meal plan complete with a shopping list and everything you need to chow down on keto for seven whole days. Download your free copy at healthfulpursuit.com/ketomeal. The link will also be in the show notes for today’s episode. Perfect if your daily keto meals have become a bit lackluster, if you’re new to keto, a bit lost when it comes to eating what and how much, or thrive on being guided on what to do and when to do it. Again, that’s healthfulpursuit.com/ketomeal. Let’s get this party started. Hey, guys. Happy Sunday. I hope you’re having a wonderful weekend. The show notes and full transcript for today’s episode can be found at healthfulpursuit.com/podcast/e39. The transcript is added to the post about three to five days following the initial air date of this episode. The show notes include everything that we chat about in all of our episodes. If there’s a supplement that somebody recommends or a book, it’s always in the show notes. Again, that’s healthfulpursuit.com/podcast/e39. Let’s hear from one of our awesome partners. The podcast is partnered with Wolfe Clinic Royal Flora, my choice in soil based probiotics. soil based probiotics are a fabulously effective approach to repopulating the gut. The soil based organisms are cultured in decayed plant matter, free from pesticides, chemicals, and toxins. Unlike conventional probiotics, which have a shortened shelf-life, are vulnerable to stomach acid, weakened by processing methods, and less likely to reconstitute or colonize the GI tract the level we need it, soil based probiotics are alive and thriving, meaning they colonize along the entire GI tract, rapidly forming into the bacteria your body needs most as soon as it interacts with saliva. Soil based probiotics from Wolfe Clinic called Royal Flora is my choice in soil based probiotic and my gut has never felt less bloated. I’m not reacting to foods in the way that I used to. For example, spaghetti squash, I can eat it. No problem. It’s great. 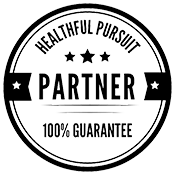 US and Canadian listeners receive 20% off when you order from healthfulpursuit.com/gut. Use the coupon code GUT, all in caps, no spaces, for the 20% discount to be applied to your order. If you have an idea for a podcast episode or want to submit praise over and above the review, which you can leave by going to healthfulpursuit.com/review, you can reach me at info@ketodietpodcast.com. It’s so important if you like the show or you have feedback for the show that you go to healthfulpursuit.com/review and enter your review of the show. Really important. If you’ve been listening to the show for a couple of episodes, you have a pretty good feeling of what you like or don’t like and I would just for you to leave some feedback. That would be awesome. That way more people can find the show. My only announcement, and it’s a pretty exciting announcement guys, is that we are going back on tour. Kevin and I are going to be jet setting around the US and Canada starting on August 29, 2017 to meet with a bunch of you, hopefully, to celebrate my book. We will be going to a bunch of places. I’ll tell you in just a second. Basically, the evening or the event is about a two-hour long, an hour-and-a-half, two hours long where we kind of sit around and I talk for a bunch of minutes about keto and my experience and why I wrote the book and then I answer a bunch of your questions, like really any question I will answer. We can take some selfies. If you have my book, The Keto Diet, I will sign your book. If you don’t have it already, it will be for sale at that event. Pretty exciting. We’re going to New York, Dallas. I’ll be at KetoCon in Austin. Denver, Phoenix, Las Vegas, Los Angeles, Winnipeg, Manitoba, Ottawa, Montreal, and then back to Balzac, which is right outside of Calgary, Alberta. A bunch more dates and times are still being figured out. Washington, I believe, is one of them. There’s a couple other things in the air like Philadelphia. If I didn’t mention your city, no fret. Don’t worry. It might still be added. You can go to ketodietbook.com/tour for more information about the book tour and to RSVP. We have a lot of people going to the events already, so if you haven’t RSVPed and you’re interested, please RSVP because we will have to shut down certain events because they can only hold a certain amount of people. If you’re thinking about going, please RSVP. You can always bring a friend and RSVP for them. I’m just so thrilled to get to meet you. I loved the first book tour. I loved meeting each and every single one of you. I have all of your names on your little sticky notes that you wrote down for me to sign your book. I have those in my office and I think I’m going to do something really cool with them. I haven’t decided yet. I really, really enjoyed meeting each and every one of you and I want to continue meeting more of you. If I didn’t get to go to your city, I’m hoping that I get to go this time around and I will see you there, hopefully. Today’s guest, her name is Alicia and she’s a registered nurse, nurse counselor at the local wellness clinic, and healthy living enthusiast. She is a wife and mother of two children. As a family, they follow a paleo ketogenic lifestyle. When she isn’t chasing after her little ones or working, you will find her in the kitchen testing recipes and cooking healthy meals that will work best for her family. Alicia has battled adrenal fatigue, thyroid insufficiency, and infertility for the past six years, yet has found healing through natural treatments and a paleo-style ketogenic diet. Today she wants to share her story with other women out there struggling with infertility and provide them hope and encouragement on their journey. Alicia really opens up to us just about what her experience was like dealing with hormone irregularities and also finding doctors that could help her with her situation. If you are frustrated with your hormones and not really sure what to do next, you’re going to love this episode. Let’s cut over to the interview. Hey, Alicia, how’s it going? Alicia Pirozzolo: Hey, Leanne. Everything’s going good. Leanne Vogel: Awesome. Thanks so much for coming on the show today. Alicia Pirozzolo: Yeah, it’s my pleasure. Like I said, I just want to be able to share my story about hormonal imbalance and infertility so that I can help someone else that’s out there. Leanne Vogel: Yeah, it’s so true. I know that so many women listening are frustrated with their hormones. I know that this episode’s going to be really helpful. Why don’t we start off by you telling us how you found the ketogenic diet? What was that like and how did you find it? Alicia Pirozzolo: Yeah, yeah. Leanne, my story starts about six years ago. I was married for about a year and fresh out of nursing school. My husband and I had recently purchased our first house. Of course, next on the list was we wanted to start a family. I had been off of birth control for about year or so and I had gotten a regular monthly period, or so I thought, and I thought I was living a pretty healthy lifestyle. At the time, I had adopted a clean eating lifestyle and exercised regularly. When we started to try to get pregnant, I honestly thought it was going to happen right away. I mean, why wouldn’t it, right? Everyone around me saw me as a perfect picture of health. When it didn’t happen right away, I started to worry. Naturally, with my nursing background, I started to research everything I could. One of the first books I read cover to cover was on Taking Charge of Your Fertility by Toni Weschler. Have you read that book? Leanne Vogel: I have. It will change your life. It’s so good. Alicia Pirozzolo: Totally. Totally. Hands down my number one recommendation for anyone struggling with fertility or hormonal imbalance. Freshly out of nursing school, I thought I knew a lot about my body, however, this book taught me so much more. As Toni teaches in her book, I started taking my temperatures, charting my cycles, and after about just one month of charting, I knew there was a problem. My morning temperatures were reading 95.6 degrees. Yeah, basically screaming I had a low functioning thyroid. The other thing I noticed was my luteal phase, which as you know, is the second half of a woman’s cycle after ovulation. It was only lasting like eight days. To hold any pregnancy, you need at least 10 days. Basically kind of indicating I had some kind of low progesterone as well. After about three to four months of trying and charting, I knew there were some issues. I called my gynecologist right away to make an appointment. I kind of had to fight to make an appointment because they instantly wanted to brush me off. They said, “Well, you haven’t been trying for a year so we probably won’t do much for you.” I finally was seen. Then, in my gynecologist’s office, she said the same thing. She didn’t want to run any of the tests that I had requested. She said, well, I hadn’t been trying for a year, so she wasn’t going to run anything even though the signs were right there that something was off balance. After begging her to test at least the TSH, she finally complied and I was totally right. My TSH came back at an eight. I had already suspected hypothyroidism and there was the proof. I felt kind of relieved that I had an answer. However, I really wanted to fix things right away and I had a poor experience at my gynecologist’s office so I knew I didn’t want to go back there. I did a lot of praying, a lot of searching for the best method to heal my body, and somehow I stumbled across a chiropractor in my area who specialized in treating thyroid disease and hormonal imbalances naturally. I made an appointment. After my first session, I was so hopeful that he was going to help me heal my body and get pregnant. In our appointment, the first thing he asked me was, “How is your diet?” Of course, I confidently replied, “I live a clean eating lifestyle, you know, whole grains, fresh fruit, veggies, dairy, proteins,” but he didn’t seem that impressed and he put me through a series of food testings. Came back that I was highly sensitive to all grains. I was in complete shock because I thought I was so healthy. Now I just realized that my version of healthy wasn’t so healthy. After leaving his office, I kind of adopted a paleo eating style of liberal fats. Looking back, I would say that it most closely resembled your daily fat burner profile with daily carb ups. I didn’t know about you or your site at the time. However, looking back, I’m like, “Yeah, that’s pretty much what I was doing.” He also confirmed I had a low-functioning thyroid, adrenal fatigue, hormonal imbalances. He put me on some thyroid supporting supplements, adrenal support, hormone balancing supplements. I did want to mention one of my favorite supplements he put me on was a hormone balancing vitamin called Equi-Fem by Biotics Research. Have you ever heard of it? Leanne Vogel: I haven’t. I’m going to write that down and include it in the show notes. Biotic Research. Leanne Vogel: Equi-Fem. What did you notice on that? Alicia Pirozzolo: It’s basically an overall vitamin for females that has additional support to help with hormone balancing. With that specifically, I noticed a big improvement. I started to have more energy. I was sleeping better. My monthly cycle started to regulate. What I thought before was a normal cycle and a normal period, after being on Equi-Fem, the thyroid support, adrenal support, I realized that I really wasn’t having a normal cycle. You know, after seeing the improvements, I was seeing clearer skin. I almost had no cramps during my period. My flow wasn’t heavy or painful anymore and my luteal phase started to lengthen. I think it’s crazy how, prior to that, I just kind of accepted those things as being a women, that those things were normal. It’s normal to have a painful period that puts you out for a day. It’s normal to have really heavy bleeding and to have acne. That was kind of an ‘aha’ moment for me that when I actually started to balance my hormones and to feel better, all of those symptoms started to go away. After staying on his kind of regimen for a couple of months, I think it was a total of about six months, I finally was pregnant. Alicia Pirozzolo: Yeah, yeah. Totally. That’s where I would say my keto journey kind of started. It didn’t end there as we can go on to talk about a little bit more, but that’s how I started researching how to do things a little bit more naturally with food and diet and supplements. Leanne Vogel: More on my interview with Alicia after this message from one of our podcast partners. The show is partnered up with Paleovalley, the makers of the only 100% grass fed and finished fermented beef stick. Each stick contains one billion probiotic CFUs. We all know how important fermented foods are to the health of our gut and the strength of our immune system, especially during cold and flu season, as well as boosting our energy throughout the winter months. Chowing down on Paleovalley’s fermented beef sticks provides your body with all the beneficial bacteria it loves in one convenient little beef stick. Their gut friendly sticks are gluten-free, soy-free, dairy-free, GMO-free, freaky chemical additive, dye, and preservative free as well as being 100% free from carbs and sugar and made with the highest quality ingredients. Exclusive to listeners of this show, receive instant savings of 20% off Paleovalley fermented beef stick snacks by going to paleovalley.com/keto. If your jaw is just tired thinking about beef jerky, it’s worth noting that these tasty treats are not tough at all, but moist with a little snap. The summer sausage flavor even tastes like those hickory summer sausages but without the gunk. Seriously delicious. Again, that’s paleovalley.com/keto for an instant 20% off savings. Leanne Vogel: What was the experience like? It sounds like you were more doing like the daily fat burner fat fueled profile without even really knowing it. Would that be fair to say? Leanne Vogel: At that point, did you know what keto was or were you just eating a ton of fat just naturally to kind of see what would happen? Alicia Pirozzolo: Yeah, I didn’t know about keto. However, even in some of the paleo worlds they’re very liberal with the fats. I don’t know that I was eating as much fat as I am now, but I was definitely doing the coconut oil in my coffee and putting the butter on my vegetables and increasing my fats in those ways. Yeah. Alicia Pirozzolo: After I was pregnant – I had a fabulous pregnancy – a good year after, I was still breastfeeding my son. I breastfed him for about a year and then my husband and I, we started thinking, “Well, we want to have another child.” My cycle did not come back. During that time, I was living still the low-carb paleo lifestyle. However, I still had this extra baby weight and I really wanted to get rid of it, so I probably did what a lot of other women do. I started seeing how can I restrict a little bit more. How can I change things a little bit more to get rid of this? I started restricting carbs, I started doing intense exercise, and still no period. I couldn’t understand because, in my mind, I was eating perfectly. I wasn’t cheating at all. I was doing everything right. I went back to my natural doctor and I found out my thyroid and adrenals were struggling again. At that point, I was still taking my supplements and everything, but I realized that my body was needing a little bit more. I decided to go on natural thyroid medication because my thyroid supplements weren’t cutting it anymore. After going on that, I finally got my period back, but it was still very irregular. I started to notice that it was fluctuating greatly with my eating. If I let my carbs drop too low, my period would go away. I was still continuing to exercise pretty heavily. By this time, I was getting anxious and I wanted another baby very badly. However, my periods were irregular. My luteal phase was still very short and I was still showing signs of low progesterone. After three months of being on thyroid medication, I did manage to get pregnant. However, I miscarried early in the pregnancy. Then the following month, I tried again. I got pregnant again and miscarried again. I mean, that whole experience was probably one of the hardest things I have ever went through in my life. It really made me sit back and think, “What am I doing? I’m not heading in the right direction. I’m not balancing my hormones. What is going to be the best path for healing?” I was starting to think I would never feel balanced again or maybe another baby wasn’t in our future. I was very emotional, losing hope. I brought these concerns to my natural doctor. He advised me to take a break from trying to get pregnant. He really wanted to give my body time to regulate and really encouraged me to help boost my nutrients. I kind of had to sit back and make the conscious decision to give up my controlling mentality, stop my restrictive eating. I decreased my exercise. I handed over things to God. I was still following a ketogenic lifestyle, however, I was not restricting my carbs or my calories as much as I previously was. After about four months of taking a break, nourishing my body, we decided to start trying again. I had been on thyroid medication with regular periods and was not restricting anymore. For the first time we tried, I was pregnant again and was able to carry to term. Now I have two children, four years and one year old. During that time, as I was going through all that, I started working at a health and wellness clinic that really promoted the ketogenic eating style. That’s kind of where I got introduced to keto. It ended up actually being the most perfect fit because I had already went in knowing a lot about the paleo low-carb lifestyle and then them teaching me more about the ketogenic lifestyle is where I started to bring keto back in. The difference between my first pregnancy and my second pregnancy is I probably was a lot more liberal with the fats during that time. Looking back, now seeing kind of how the first time I changed my eating was more of like the paleo low-carb and I feel like I’ve almost went full circle because that’s kind of where I’m at now today. It seems that that’s where my hormones and my body are the happiest. Leanne Vogel: You mentioned the paleo low-carb. Can you tell us, maybe, because I’m sure a lot of people are wondering right now, what do you eat on a daily basis? What did yesterday look like for you? Alicia Pirozzolo: Right now I’d say I’m most closely following your daily fat burner with the daily carb ups. I am still breastfeeding my one-year-old daughter. That’s part of it. In your book, I know you talk extensively and how that’s the best for breastfeeding women. I would say I have toyed with other profiles, but as of right now with breastfeeding and kind of where I’m at hormonally, I hands down feel best on the daily fat burner with daily carb ups profile. I absolutely love your flax focaccia recipe. Leanne Vogel: Yeah, that stuff’s good. Alicia Pirozzolo: Yeah, totally. I actually make them into little muffins and I usually have one of those with a couple of eggs every morning for breakfast with maybe like a small rocket fuel latte. Then for lunch, I would say I eat some proteins on top of like a giant salad with some sort of either homemade dressing or just olive oil and vinegar. Then at night, I usually have some sort of protein with a lot of veggies. Usually my carb ups are typically more of a starchy carbs I tend to gravitate towards. I do sweet potato fries a lot. Leanne Vogel: That’s awesome and I think very interesting too. I know for my hormones, it really depends on even the cycle that I’m in. I’m finding now that some months I do better with daily fat burner, fat fuel profile all month. Other months, I can get away with more of a faux keto where I’m only doing one or two carb ups maybe a week. It’s really interesting to kind of sit back and just let your body kind of tell you what it needs and then switch between the profiles as to what you feel your body would be best with. Alicia Pirozzolo: Yeah, definitely. I think that too that once I’m done breastfeeding, being able to play around with some of those other profiles, I definitely could see myself doing that more in the future. Keto salads. They’re a staple in our house, great for when you’re in a rush, need to boost your fat intake. Salads can hold a lot of fat in them and still taste great or give you that volume in your belly that you don’t always get from standard keto food. Let’s talk dressings for a sec. Sure, you can make your own and they’ll probably taste great but sometimes making your own dressings takes up time, requires ingredients on hand, and just isn’t practical. Enter Primal Kitchen’s line of avocado oil based salad dressings. They’re keto, packed with natural beneficial fats, double as a marinade for your favorite proteins, are nutrient dense with ingredients like avocado oil, oil of oregano, and apple cider vinegar, plus they’re always free from dairy, gluten, grain, refined sugar, and soy. Choose your favorite like Honey Mustard, Greek Vinegarette, Green Goddess, Caesar, or Ranch dressing. Again, they’re all keto, all dairy-free, and all delicious. Try a bottle or five by going to healthfulpursuit.com/primal and using the coupon code FAT for 15% off your entire order. Again, that’s FAT, all in caps, no spaces, for 15% off at healthfulpursuit.com/primal. Alicia Pirozzolo: You know, I think that my mood overall, my mood would fluctuate a lot with my cycle. I would have anxiety or be on edge a little bit more. Then with my period, the terrible cramps and increased heavy bleeding. Those are some signs that I think women, amongst each other, they kind of joke about that these are normal things that we just experience monthly or the moodiness and everything, but I think it is an indicator that something could be off balance. I didn’t realize that until I had felt more balanced and healed my hormones a little bit that those things aren’t necessarily normal and how much better I felt once I was able to dig deeper and kind of figure out the source of those things. Leanne Vogel: How long, really, when you started adding more fats, how long did it take for you to start feeling better, like your energy and your moods? What was that process for you? Do you remember? Alicia Pirozzolo: Well, I would say that it was a gradual process. Like I said, I kind of started out cutting out the grains and all my allergenic foods right away. Right away, I felt instantaneously better. Then as I started kind of adding in more fats, kind of being a little bit more particular when I would eat my carbs, that’s when I really noticed difference, especially in like my hunger and how long I could go in between meals, and then on my overall energy as well. Alicia Pirozzolo: Yeah, it was difficult. I think a lot of people around me had a lot of questions and were a little unsure. At that point, I wanted a baby more than anything out there so that was kind of like my motivating factor. Just the next day I walked out of his office, I said, “Nope, I’m not going to eat these things. If this is what’s going to help me heal, then this is what I’m going to do.” But, then again, I came from kind of cleaning out a lot of things out of my diet prior to that. It was just another thing that I had to kind of take out. The things he had me taking out, I did right away like the grains. Then some of the other things, cutting out to be more, I guess, keto friendly, that happened over time. That was more of a gradual process. As I continued to learn about nutrition and learn about ketogenic living, then that’s when I started cutting out some other things a little bit more gradually. Leanne Vogel: Yeah, good call. I think especially you mentioned, because you had that motivator, it was a lot easier for you to kind of stay focused. We chatted a little bit about how you felt with carbs and what that process has been for you to kind of find your carbohydrate tolerance. You mentioned sweet potatoes. Are there other carbs that you find resonate better with you than other carbs when it comes to your carb ups? Alicia Pirozzolo: Well, I do sweet potatoes. I do plantains. I will also do, I really love cassava fries. Those are one of my favorites. I haven’t noticed tremendously the difference between … I mean, obviously staying to those healthy carbs, I feel so much better. If I would bring in something that … I do not do well with rice. That is something that I do not feel well with. If I do eat rice, I can almost kind of feel the inflammation in my body. Leanne Vogel: Me too. Crazy. Alicia Pirozzolo: I would say, you know, I stick to the sweet potatoes because they’re almost like a safe carb for me. I do so much better than I do with rice or corn or any of the other grains out there. Alicia Pirozzolo: Sure, sure. Well, right now, I’m still seeing a natural physician. He does have me on several supplements. They’re some of the same supplements that he had me on when I wanted to get pregnant for the second time. The number one thing he put me on was magnesium and zinc. He did that right away as well as liquid minerals. It’s like a liquid mineral complex that I take every day just to keep my minerals up. Fermented cod liver oil, I’ve done a lot of research on that and that one is a really good one for hormones. That’s something I also take every day. Vitamin D, I take that. Then I also am on just kind of an adrenal support and a really high quality prenatal vitamin. Those are some of my go-tos right now. When I’m done breastfeeding, I do plan on going back on the Equi-Fem because, like I said, that was a game changer for me. I felt really good on that one. Leanne Vogel: Cool. Any recommendations or things that you noticed with PMS specifically, of how to deal with hunger or fatigue, headaches, mood swings? Do you notice anything with that, tools that you use to help with that? Alicia Pirozzolo: I would say probably first and foremost just to listen to your body. I truly believe there are certain times of your cycle that you are going to be a little bit more hungry than not hungry and just kind of listening to where your body is and where it’s at and just feeding it as you need to. Leanne Vogel: I think that’s a really good point. I know that I get really hungry at certain points in my cycle. When I don’t honor that, I end up getting a headache and getting mood swings and usually being tired. It’s kind of like very true to your point, Alicia, of just listening to your body and if you feel like XYZ, look at that and see what’s going on there. Usually if you’re not honoring that, more symptoms are going to pop up. Well said. Leanne Vogel: Did you have any issues with anxiety or depression before starting keto? I know that having miscarriages and stuff would have been pretty stressful and horrible for your well-being. How did you deal with those emotions throughout all of that? Alicia Pirozzolo: Yeah, it was difficult. I think that having any sort of depression during a time like that is normal, definitely. You know, I think the biggest thing for me was just kind of digging a little bit deeper into my faith, realizing that everything was not in my control. I had to give it to God and do what I could on my end too to help heal, but just kind of releasing that and not losing hope in the fact that a pregnancy was going to happen in the future and continuing to nourish my body as needed, continuing to eat the good fats and not restrict anymore like I was. Exercise also was a big part of my life and telling myself that it was okay not to exercise as much as I was and just kind of tone things back a little bit and live in the moment and let my body heal as necessary and also being patient with my body. I know you talk a lot about positive self-talk and different things that you can say to yourself. I found a lot of your podcasts super beneficial in those areas of my life specifically. Leanne Vogel: I’m happy that could help, for sure. Yeah, that’s why we do what we do. Hopefully even with you coming on the show today and just sharing your experience with somebody out there that may be struggling like you did, that you can speak to them right in that moment and help them overcome that before they have to experience all the things that you did. Leanne Vogel: Totally. What do you feel is missing in the ketogenic space specifically for women? What do you wish was out there for women that are keto? Alicia Pirozzolo: I mean, a lot of what you’re doing, Leanne. I think talking about keto and how it can help a woman and her hormones and that specifically too promoting this idea that we need to listen to our bodies and there’s not a one size that fits all. I know that when I’ve previously tried to do the 20 carbs or less and do the strict keto, my body just goes crazy. I think that, in my mind, I think, “What am I doing wrong? How come this isn’t working for me?” When truly it could just be that one size fit all keto mentality isn’t the best for all women. Leanne Vogel: Yes. Yeah, I had to learn that the hard way, for sure. What’s your favorite keto thing to eat right now? What’s your go-to fatty fattiness thing? Alicia Pirozzolo: Well, I do love my fat bombs. Most of my fat bombs usually consist of coconut butter or sun butter. They’re two of my favorite flavors. One of my favorite fat bombs is like a cookie dough fat bomb. I usually mix sun butter with coconut oil and butter and then like Swerve or liquid stevia. I mix that together and I usually add a couple of Lily’s chocolate chips. Then I put them in the freezer. I always make them like mini so that if I just want a tiny little treat with a meal or something, that it’s like a tiny little bite size and I can just have one. Leanne Vogel: That’s a really good tip. I used to do this thing where I would make an entire batch of bark and it took up the entire portion of the silicone mold that I had. It was probably like six servings in there. If you have an entire silicon mold just sitting there with a bunch of bark and it’s a fat bomb, you’re just going to eat it all even if you’re not even really hungry. I totally forgot about this. I need to make this bark again but in smaller sized portions because I would just sit there and eat all of it, which was okay but it was like a constant thing that just kept happening. It was so good, but often all you really need is just a little kick of fat. That’s a really, really awesome tip. Alicia Pirozzolo: Yeah, most definitely. I was finding the same thing. I would make bigger ones and then I would cut them in half, but then just knowing that other half was in there, I had to go back and eat it. Leanne Vogel: Of course. Totally. Any other things that you want to share with listeners about their hormones or just any word of encouragement or stuff that you went through that you want to share with people so that they don’t have to go through all the struggles that you did? Alicia Pirozzolo: Yeah, definitely. So many people out there struggle with infertility and it’s something that’s just very dear to my heart. My main reason for volunteering my story is just to provide hope for other people out there struggling with similar situations. That would be my message to those out there is try not to get discouraged. Try not to lose hope. Know that your body wants to heal itself, you just kind of have to help encourage it in the right direction. Just keep trucking along, keep trying to figure out what’s going to work best for your body, and hopefully you will find some success through that and some of your infertility struggles. Leanne Vogel: Yes, beautifully said. Thank you so much for coming on the show today, Alicia. The show notes and full transcript for today’s episode can be found at healthfulpursuit.com/podcast/e39, including all of the awesome things that Alicia mentioned. I’ll include books and links and supplements. You guys can check that out. The transcript is added to the post about three to five days following the initial air date of this episode. Thanks again for coming on the show. I know that your story’s going to help a lot of women out there and we really appreciate it. Alicia Pirozzolo: Oh, no problem. Thank you, Leanne. That does it for another episode of The Keto Diet Podcast. Thanks for listening in. You can follow me on Instagram by searching Healthful Pursuit, where you’ll find daily keto eats and other fun things, and check out all of my keto supportive programs, bundles, guides, and other cool things over at healthfulpursuit.com/shop. I’ll see you next Sunday. Bye.